The shoemaker is always too busy making shoes for other people to make a pair for his own child. In other words, we often get so tired up in our work and providing for others that we forget to take care of our own children. This is the case with me! Not my children, but myself. I am in the right place to really have a lovely collection of clothes. I just never found the time for myself. I am too busy making patterns for other peoples clothes, and I forget about doing the same thing to make my own wardrobe better. Yes, we all need clothes. We all wear clothes, out of decency! 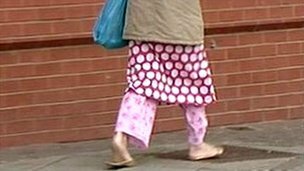 I have, however, spied a few people at our local supermarket in their pyjamas and slippers, people in paint spattered clothing when you are sure they didn't 'just pop out' to get some milk in the middle of a paint job... They are covered decently, I suppose, but as far as I'm concerned the choice of what they are wearing isn't decent at all, it just shows a total lack of self respect. But the day I got dressed and realised that everything I was wearing could have been worn by a man, and I'd been dressing like that for quite a while, was a sobering one. New Zealand is a relaxed place, where practically anything goes, and I think that was beginning to wear off on me too. And when I did need to go out somewhere nice, I didn't have anything to wear. So, after looking around on the net about the actual meaning of clothing, I have decided a more apt word for what we wear should always be ATTIRE. attire(n) - clothing of a distinctive style or for a particular occasion; "formal attire"; "battle dress"
So, apart from my very necessary work wear, my farm clothes/worm farming/horse riding clothes,which are good, dont-care-if-I-get-dirty items, I am aspiring to improve my attire for other occasions. And I will never be seen at the local supermarket in them! Great resolution! Now, next time we get together to sew you need to make something for yourself at the same time! Oh, but... I like making things for you! But yes, you are right! I have quite a few things I need to make so its a deal! Dear Linda, I hear you! I would always rather make something gorgeous for someone else than for myself. For a long time when I had a bridal shop, my self imposed uniform was purchased mostly from K Mart! And I never spotted the irony of this. These days I have a better handle on my own style mojo and make more of an effort, and it feels good. But my first call is always to make something for someone else first. Loving your blog, by the way. I am looking forward to seeing these new clothes! It's so easy to be creative but totally uncreative in how we see ourselves, and yes, I agree, making something lovely for someone is so nice. I always find one of my problems is pinning stuff on myself, and also I get rather slap dash about how things look. My wedding dress was made in a few afternoons , and I didn't bother to finish any of the seams nicely as it was chiffon and I didn't have an overlocker. I did have a dream before the wedding that the lining had been dyed pink and there was no hem on the dress and I forgot my shoes... Oh dear that was 32 years ago and I have been doing similar things ever since! Heheh, that i really funny. It's our naughty secrets that we don't finish our own clothes properly! I have such nightmares about weddings all the time - forgetting to make the bridesmaids' dresses and it's three hours to the ceremony is a common one. It always seems harder to make things for yourself than for others, I'm still trying to work out why. I love the word 'attire', it just holds so much more than the word 'clothes'. I've not been in NZ long enough to dress in relaxed clothing. I hope it never comes in some ways. The thrill of making something where the fabric is that little bit more special is something I love. Even though I rarely sew for someone else it's so (or sew) much more satisfying and I find I put more effort into what I'm making. I love seeing how people dress in England. They look so much more feminine than here in New Zealand. In South Africa too, women dressed so much better.